‘A. Briggs’ is a name on the Bottesford ‘church list’ of WW1 servicemen. There was nobody of this name in Bottesford in the 1911 Census, but it seems most likely that the name refers to Arthur Henry Briggs, a son of Thomas and Annie Briggs, whose other sons included Herbert Abbott Briggs, Harold Briggs and Joseph Cecil Briggs, all of whom served in WW1. Arthur Henry Briggs was born in Easthorpe in 1882. 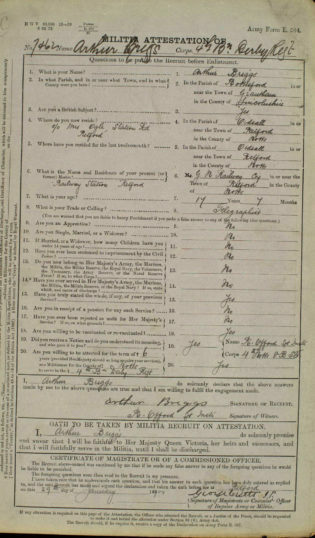 His parents were Thomas Briggs, born in 1859 in Bottesford, and Annie Maria (nee Abbott), born in 1861 at Millfield, Nottinghamshire (though oddly her place of birth was stated as Peterborough in the 1911 census). His father was a railway platelayer. In 1891, the family lived in one of the cottages at The Green, in Bottesford. They had five children by this date: Arthur (8), Alice (7), Ernest W (5), Harriett (3) and Herbert (1). By the census of 1901, they had moved to the Bunkers Hill Cottages, Easthorpe, and the family grown with the births of Thomas (4) and Joseph Cecil (1), though Arthur and Alice had both left home. Thomas Briggs continued work as a railway platelayer. By 1911 there were two more children, Lilian (9) and Clarence (7). Arthur Henry had married Florence (Florence Louisa Bonnett) in Basford, Nottingham, in April 1908, and in 1911 their address was 6 Garnett Street, Netherfield, Nottingham. Arthur was 28 and working as a hewer on the coal mines. They had two daughters, Gladys and Winifred Maria Abbott. 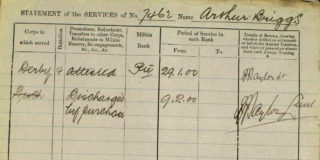 There is a rather unusual service record for Arthur Henry Briggs, dating from 1900. 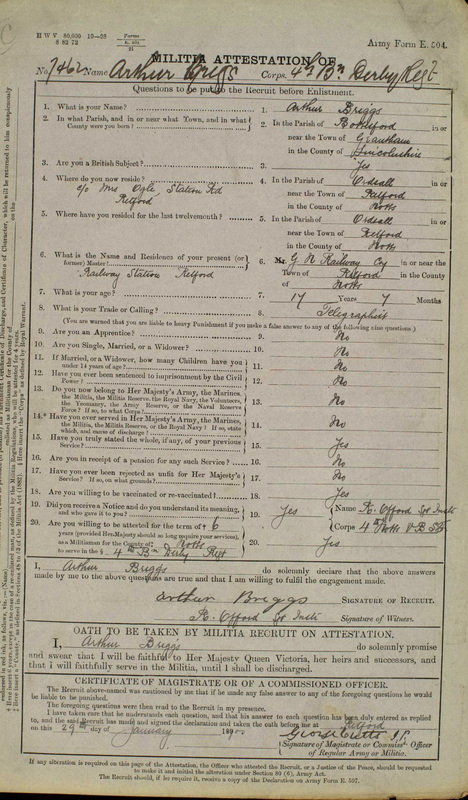 On the 29th January, 1900, he attested at Derby, and became 7462, 4th Battalion, Derby Regiment. At that time his address was c/o Mrs Ogle, Station Rd, Retford, Notts. At this date he stated that he was 17 years and 7 months old, and had worked as a telegraphist. However, the record goes on to say that on the 9th February, 1900 (11 days after he attested) he was ‘discharged by purchase’. This could mean that he changed his mind and was allowed to buy his way out, but it could also mean that someone, probably his father, paid for him to be discharged perhaps on the grounds of his age. This was during the Boer War, and his family might well have been concerned for his prospects as an under-age recruit. No definitive record of WW1 service has been located for Arthur Henry Briggs, other than the fact that he is one of the WW1 servicemen on the Bottesford ‘church list’. Arthur Briggs is a relatively common name, and medal index cards for men of this name range from the Royal Artillery, Royal Engineers, and other units of the forces. Perhaps, as an experienced coal miner, he might have joined one of the tunnelling units of the RE, but this is speculative. There was an ‘A.H. Briggs’ who was 254761 Pioneer, Royal Engineers, who was awarded the Military Medal, but this man gave his home town as Leeds. It therefore not likely that this was the miner from Nottingham. For these reasons, we are not able to set out his service number, rank or unit, unless further information comes to light. Electoral records show that Arthur Henry and Florence Louisa Briggs lived at 12 Harrogate Street, Netherfield, throughout the 1920s. However, in the 1939 register they had moved a short distance and were at 82 Conway Street, Carlton. Here were Arthur (born 28th May 1882), describe as a ‘destructor feeder’, Florence Louisa (born 8th November 1884) and Ivy (born 28th September 1922), who probably was their daughter. Ivy was said to be single and employed as a ‘clerk (furniture)’. Florence L. Briggs died in Nottingham in 1952, aged 68. Arthur H Briggs dies in 1954, again in Nottingham, aged 72. WW1 service details have not been confirmed for this man.